The time has come when travel is now abundant – Spring Break, Wedding Weekends, Trips to the Hamptons, weekend getaways, etc. 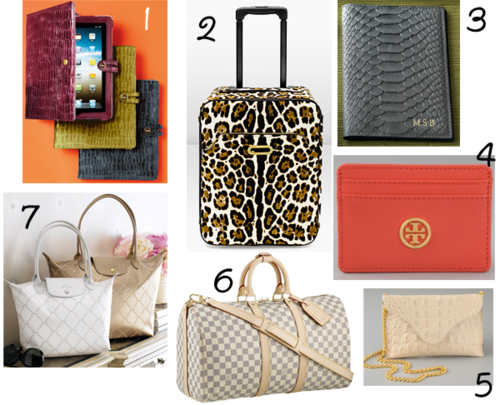 We have found the ultimate travel accessories and stylish stow-away’s for all you jet-setting femme fatale’s out there! 3. Neiman Marcus Exclusive Passport Cover – $68 – add your monogram as well! 4. Tory Burch Saffiano Slim Card Case – $85 – to fit in your small crossbody bags or clutches on vacation! 6. Louis Vuitton Damier Azur Canvas Keepall 45 w/ Shoulder Strap – out of stock online, but go to the Galleria and get one for your next trip!